It's an axiom of the media business that the job of reporters is to comfort the afflicted and afflict the comfortable. In the case of the stock market, the media loves nothing more than to pluck struggling analysts from obscurity and propel them to fame and fortune on the backs of a few good calls. Then, once those analysts are firmly ensconced on their thrones, the media shoots arrows at them when their next predictions fail. A case in point: Meredith Whitney. Whitney is the photogenic Brown University alumna married to a now-retired pro wrestler who catapulted to fame for correctly predicting that Citigroup (C) would cut its dividend in October 2007. Famed author Michael Lewis attributes a $390 billion loss in the value of stocks to Whitney's call, according to Bloomberg. Now, people pay attention to her picks -- including her call to buy shares in Visa (V) which proceeded to under-perform the S&P 500 and to avoid those of Capital One (COF), which went on to triple. When she's wrong, the watchers wring their hands with delight, and as Bloomberg reports, they've had many opportunities to do so lately: Whitney made "six accurate and 13 inaccurate stock forecasts through Sept. 30, based on annualized returns." She bet right a mere 37% of the time against the 81-company S&P 500 Financials Index. Whitney is hardly the first analyst whose rise to stock-picking queen was followed by a brutal kicking to the curb. There was Queen of the Net, Morgan Stanley's (MS) Mary Meeker who rose to fame in her coverage of Internet stocks during the 1990s only to get shunted aside after the bubble burst. And then Goldman Sachs (GS) analyst Abby Joseph Cohen rose to fame on her bullish view on stocks during the 1990s -- that proved to be a lucky guess. In the last decade, the S&P 500 has dropped. Why Do Stock Gurus Exist? The media creates stock gurus because reporters like to write about them more than examining what really moves stock prices. The problem is pretty simple. Thanks to Wall Street's enormous economic role in our society and its big advertising and lobbying budgets, it needs to convince people to buy stocks. That was Cohen's job at Goldman. Unfortunately, nobody -- not even highly paid Wall Street analysts -- can predict what will happen to stocks. That's because all the traditional ideas about how to value stocks -- including analysis of their income statements and balance sheets, forecasts of their earnings, or predictions about growth in their industries -- fail to tell you whether a stock is going to rise or fall. To Whitney's credit, her prediction on Citigroup's dividend cut was probably based on solid analysis of its actual cash flows and the vulnerabilities on its balance sheet. 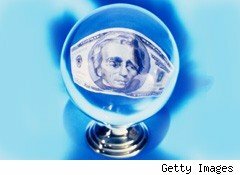 Most importantly, her prediction was not widely shared among those who traded in Citigroup stock. When Citigroup cut the dividend, stocks plummeted on the negative surprise. Reporters who cover Wall Street almost never have backgrounds in math or finance, and most of them are uncomfortable analyzing financial statements. If that were their skill, they'd probably take jobs as analysts. What they do like to do is to talk to interesting people and tell compelling stories. Numbers, in their view, are boring and personalities are exciting. So the financial media came up with an innovation -- a way to turn something that bores them into something compelling. They turned themselves into what amounts to the People Magazine of Wall Street, creating and destroying gurus in the same way that Hollywood gossip columnists propel the fortunes of stars. Simply put, stock gurus exist because they make reporters' jobs more interesting and they help Wall Street sell stocks. But gurus are just like everyone else: If there are enough of them voicing different opinions, some will win the lottery and guess right on something important. The thing is that the stock market has changed dramatically and most Wall Street analysis has not adapted. As I've written about in previous DailyFinance columns, 70% of stock market volume is conducted by high-frequency traders (HFTs). HFTs locate their computers within a football-field's distance of the trading exchanges. They buy trading data and feed it into their computers, which tell them which stocks to buy and which to sell. And the HFTs get their front-running trades executed a split-second before the less-fortunate majority. HFTs hold onto a stock for an average of 11 seconds. While I don't know how their stock trading computers work, I would be willing to bet a Fort Knox worth of gold that they aren't factoring in what Whitney or Cohen have to say at the moment before they put in their trades. What would constitute valuable insight in my opinion is finding out how those computers make their decisions and reporting that to the general public. Unfortunately, those trading algorithms are considered proprietary and no regulator appears poised to pry loose that information to make the markets fair. So as dumb as it is, the media will keep creating and destroying stock gurus. But just because that helps reporters keep their jobs and helps Wall Street sell stocks, it doesn't mean that you should bet your savings on the gurus' guesses.